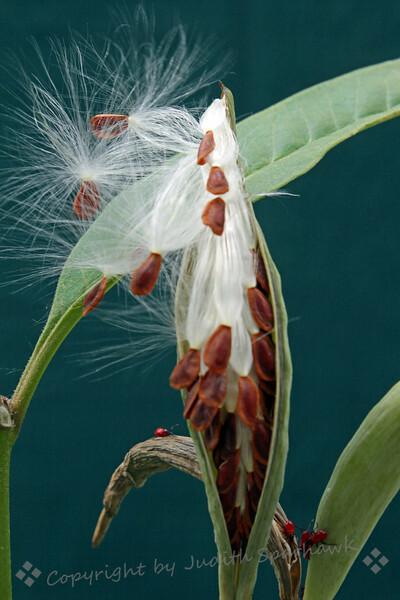 Lotsa Bugs on Milkweed Pod ~ I have been enjoying my new milkweed plant, with the seed pods opening to disperse the seeds. I had one Large Milkweed Bug foraging on the plant for a couple of weeks. When I looked for it today, it was gone, but then saw quite a few really tiny orange bugs, which I assume are babies left by the big bug. In this image, there are several of the tiny bugs near the bottom of the photo. These bugs are much smaller than the milkweed seeds, and that's SMALL!